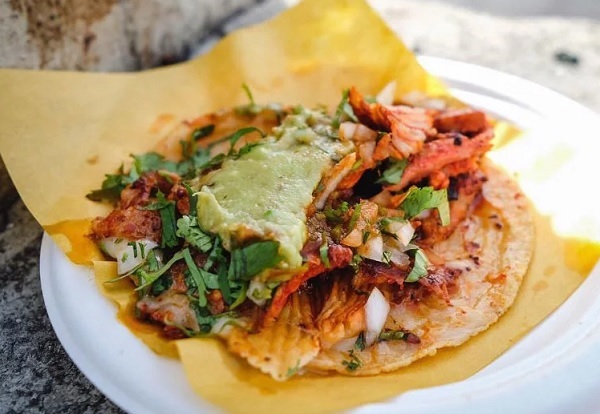 Jorge Alvarez-Tostado, the strikingly charismatic taquero who goes by Joy, is carving adobada off a trompo. The marinated pork shoulder from the vertical spit is then put on a freshly made corn tortilla. Joy (as the man is widley known in LA), carefully calibrates the amount of salsa, guacamole, onion, and cilantro on each adobada taco. He also expertly puts together carne asada, chicken, and mushroom tacos. He’s dancing while he lovingly taps the trompo with a knife. He’s mugging and making kissing sounds for pictures and videos. He’s shouting catchphrases as he encourages guests to photograph the action at Tacos 1986, which has quickly become L.A.’s hottest street-food sensation with its Tijuana-style tacos and exuberant frontman.